I'm looking for a quality cassette lockring tool that has a 3/8" or 1/2" square drive on it so that I can use a ratchet or torque wrench for installation and removal. Does anyone know of one that offers that? It appears that the park tool cassette lockring tool doesn't and can only be used with an open end wrench. Take a visit to your locale bike shop, they will have it! depends if Shimano or Campy. the Shimano branded one has a 1/2" drive for wrenches. i use the Abbey Tools Crombie that has Campy on one side and Shimano on the other. one of my best tools. Or try a socket (or crows foot wrench). Depending on your torque wrench, you may also need an adapter. Mom: He was very sickly until he started riding around on that bicycle. Dad: Yeah... well... now his body’s fine, but his mind is gone. I use what Manekinico suggested, but of course you will need a chain whip, too. Appears to be confusion here. As in CallumRD1 the author does not know how wrenches or sockets work. Go with what ManekiNico says. Both the Park Shimano and Campagnolo lockring tools fit into a 1" socket. Put the 1" socket onto your 3/8" or 1/2" ratchet torque wrench. I recently bought this one - good value and would fit a socket or fits my torque wrench directly (1/2” hole I think). I'm left handed, if that matters. There is no confusion here; I know exactly how wrenches and sockets work. (I'm halfway through building a Pitts S-1S biplane at the moment so I definitely know my way around a workshop!) 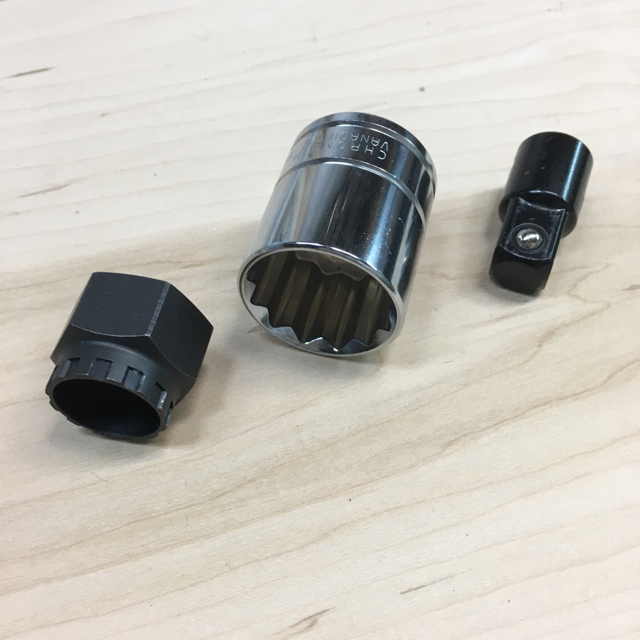 I am looking for a cassette lockring tool that has a square drive recess in it so that I can attach it to a wrench directly. As suggested above, I could use a 1" socket on the park lockring tool, but that wasn't the solution I was looking for. It is a good suggestion, though. Functionally the two solutions are very similar, but in my opinion the single tool is superior, hence why I was looking for one. Thanks for the suggestion. I'll look into that model. Cyclus do 3/8" tools in both Campag and Shim/RAM patterns. 1/ Only use them for fitting lockrings. They don't offer really good purchase. 2/ Use with a beam or electronic torque wrench as the clicker-type ones do not work well with serrated lockrings. This topic raises my eyebrows a bit. I have never used a torque wrench on a cassette lockring, just a crombie. My cassette lockrings are always secured by feel and i have never had one come off. I’m sure it is pretty cool to have everything torqued to spec, but in this case i don’t see the need. Not cheap but with such specific requirements most things are not. Had the same desire, but what I did was tack weld a cheap adjustable wrench to my cheap cassette lockring tool. For torque I put my hook scale in the hole at the end of the and pull to a pre determined value. @CallumRD1, never presumed that you might not "know how wrenches or sockets work," just thought you might have overlooked a possible solution. Lord knows I do it all the time. Sorry for not answering your question. You won't get an argument from me that a direct wrench/tool connection will always be better than wrench/socket/tool. I'll admit my own setup is a little wobbly what with tolerances being on the loose side. And yeah, @Frankie - B, torquing the lockring is probably overkill. It's more a question of "Well, since I'm already torquing stuff down…"